All sorts of goodies are growing in my garden. My tomatoes are coming in very well and I have little peppers, blossoms on my cucumbers and even a few tiny strawberries. What I'm not growing this year are green beans. Don't get me wrong, I love green beans...but I'm not very skilled at preparing them any other way besides opening a can. There is a huge texture difference between store can beans and fresh. For years, I wouldn't eat peas because all I'd tasted were the canned variety. Fresh is usually better. Except for green beans. 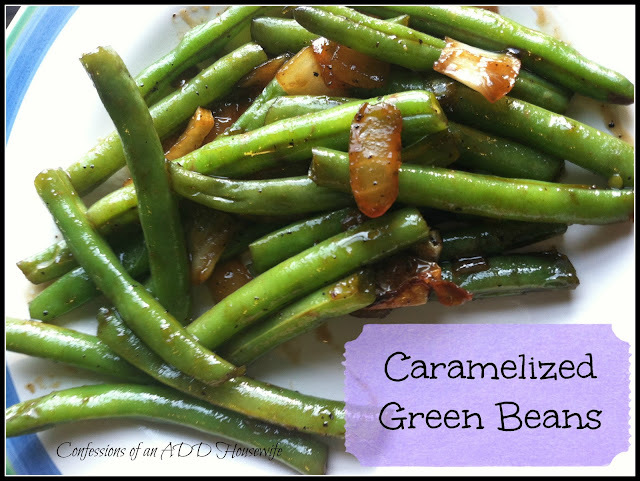 My mission this summer is to find a delicious green bean recipe using fresh beans. Tonight's side dish of caramelized green beans got mixed results among the kids. Little Miss loved them and the Boy hated them. That wasn't surprising. The Boy has texture issues and doesn't like most cooked veggies. They did taste pretty good to me. I mean, you can't really go wrong with a recipe that calls for half a stick of butter and two onions. Butter makes so many things better. Chop the ends off the green beans. Cut them in to uniform size to help even cooking. While preparing beans, boil a medium sized pot of water. Once beans are cut, place them in the water and cook for 2-3 minutes. Drain. Meanwhile, in a large skillet, melt butter over low heat. Add onions, and continue cooking on low for about 5-6 minutes. In a small bowl, mix together soy sauce and brown sugar. Add the drained green beans into the skillet and "stir fry" for 4 minutes. Next, pour on the sauce. Continue cooking and stirring the beans for another 3 minutes until the sauce begins to thicken. Season with salt and pepper to taste. These sound delish. I just made something like this a week or so ago. I never thought I would get so excited over green beans. I have a new appreciation for green beans, so i'm super glad to see this! thanks! I LOVE caramelized onions so caramelizing green beans has to be amazing too... right? I can't wait to try this! Best way I have tasted fresh green beans is Miss Paula Dean's recipe! Add onion, bacon, her house seasoning which has garlic and a few other things and then you boil it in chicken broth instead of water...changes the texture to be more like canned beans and makes it ooooh soooo tasty! Google it and give it a try. I love green beans and this sounds delicious. l Thanks for sharing on Foodie Friends Friday. I agree, I love green beans and this sounds sooooooo good! Pinned!